Listening to music, catching a ballgame, keeping up with the news.... There are several reasons why a strong AM/FM tuner can be a key addition to your home stereo system. The NAD C 427 tuner makes sure your radio stations come through clearly by using a low-distortion design and features such as "FM Mute," which eliminates inter-station tuning noises,. With the C 427's 40 available presets and simple controls, you can store and scroll through your favorite radio stations with ease. The tuner's screen displays Radio Data System information, so you can see what station, artist, and song you're listening to (available with select FM stations). You can control it with the supplied remote, or integrate it with your existing external controller or universal remote. 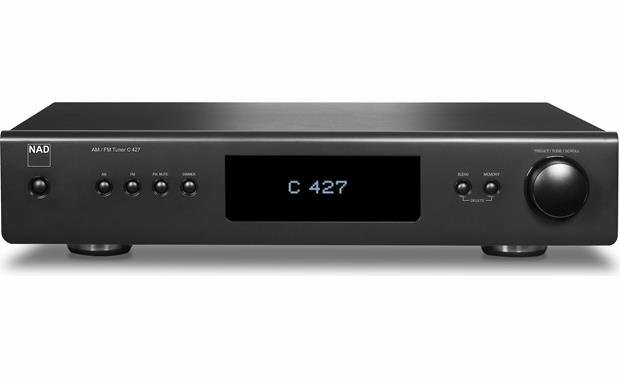 The NAD C 427 works well with NAD's highly-regarded integrated amplifiers. Purchased. Cause I needed an RS232 controllable tuner that provides feedback. It fits the bill very well. Sounds great too. Does this unit come with a coax cable connection for an external antenna? Can the front panel display of the C 427 be turned completely off with the dimmer button while the unit is operating? Not that I'm aware of. Mine has are 2 settings: Bright and dim, and the dimmer button simply toggles between them. That would be a disappointing "no, not that I've been able to find". Chris L , no , at least my NAD C 427 cannot . The dimmer control toggles between a low light ( suitable for night time listenlng ? ) and a brighter setting only . in terms of sensitivity, pulling in weak stations- how would it compare with a beast like the McIntosh MR-78? Remember that ALL FM tuners sound awful, because that is the nature of the FM signal. I would NOT buy a great FM tuner! Either spend a lot more money and get an HD FM tuner, and spend about the same amount as the C 247 and get yourself a great DAC. My iTunes sounds better through my stereo than the 247 does. But the DAC is not cheap. Crutchfield has a great selection. I have never owned the MC MR-78, but I do know that the MR-78 was a analog tuner from the 1970's, so that would be heard to beat! Using an indoor dipole antenna, the sensitivity on the C-427 is "OK" at best IMHO. I was able to dial in some fringe stations with it (that I was also able to dial in on my 1970's Sansui tuner). But I was getting some noise on those stations with the C-427 (which was not present on the old Sansui). While I had high hopes and thought I needed this modern day tuner (and there a barely a few to choose from these days), I wound up returning it. If you spend time listening to a better analog tuner, then listen to the C-427 you will hear what I mean. Please note this has nothing to do with nostalgia, this has to do with sound. I personally will forgo conveniences like a remote and station pre-selects for superior sound. IMHO, everything on the C-427 sounded extremely synthesized and compressed, like the audio is being run through a series of filters. AND the sensitivity was just OK. Find an old tuner (McIntosh, HH Scott, Kenwood, Sansui, etc). Find a tech who knows how to service a analog tuner. Have them check it out and service where needed, *AND run a full alignment*, and you will be happy. It is also possible to do this for a little less money than the cost of the C-427 (Say if you end up with a Sansui or Kenwood). I would rate it okay, not the best, not the worst- with a good antenna (roof-mount) I improved the signal strength a lot and made sure I used a powered splitter to run it to more than one unit. I still sometimes get less-than-spectacular performance, but then it blends mono & stereo modes and that helps. For the $$, it's a decent unit. Can't give you comparison to MR-78, but can tell you that in the same house I get better reception with NAD than with older Yamaha T-80. Overall, very happy with NAD Tuner for the money. I don't know the anwser to that question. However, McIntosh gear is a large step better than NAD. I no longer use the NAD C427 in my system. It is in its box in storage. For 2 channel I just have my CD player hooked up to my pre-amp and amp. For home theater, I have a Onkyo RZ-810 AVR which I use its tuner for FM listening. To improve the AVR tuner's ability to get better reception, I use a RCA TV antenna (i.e. rabbit ears) does a fantastic job. So in my mind whether you go with McIntosh or NAD use rabbit ear type antenna. You will have no problems with reception. Does the color match the NAD 316 amplifier? Yes. The NAD amps are all flat black (metallic, not shiney black plastic) as is the C427 tuner. (I have a C372 integrated amp and a C427 tuner). Don't know. I bought the NAD C 356BEE amplifier. This tuner matches that. it does not include one of those. It does have the coax connector for an FM antenna only. It still uses a two wire connection for AM. Hi Gerald. Sent just a yes answer but intended to also suggest looking closely at the second picture provided by Crutchfield. That picture is the back of the unit and you can see the coax connection on the left. Hope this helps. Yes, I've attached an FM antenna via the coax connection - terrific reception! can i connect this directly to the RCA inputs on my Pioneer soundbar or do I need an amp? 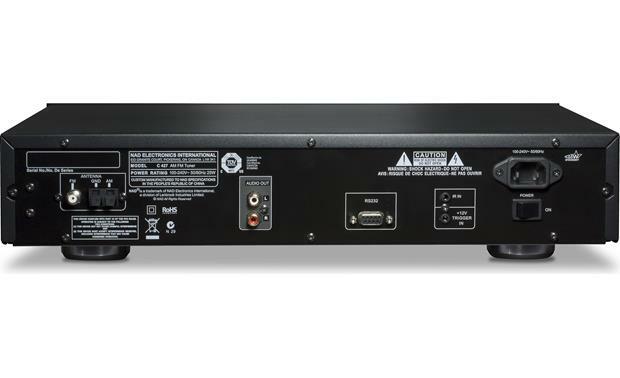 Being that your soundbar has RCA inputs it will act as the amp in this scenario. DA, This is simply a tuner, nice quality, but does need an amp. Output is straight line level, intended to plug Into preamp/amp. There is an RS-232 serial cable connection to a PC, etc., but I have not used that interface, so cannot help out there. Assuming that the soundbar has its own built-in amplifier(s), I believe you would connect the tuner directly to its RCA inputs, assuming that they are not otherwise needed. no it doesn't support hd radio its a high quality old fashion tuner. I could also do without the v in most audio products. good luck! The NAD C427 does not support HD (digital) radio. I, too, wondered why this seemingly easy-to-provide feature was not available in mainstream, or even somewhat high-end, tuners. What are the dimensions of the NAD C427? I'm limited to a maximum width of 17 inches. 17 1/8" W x 11 1/4" D x x 4" H It is a great tuner! WIDE IS 17.1/8 - DEEP IS 11.1/4 - WIDE IS 17.1/8 AS PER MEASURE BY MYSELF. Dan, you're in luck...the dimensions are 17W x 4 h x 11 1/4 deep. I love mine, hope this helps MCH. its 17 1/8x3 15/16x12 7/16 hope that helps good luck! The front panel is 17 1/8" wide. is this WORTH the money???? Beautiful tuner. Simple yet brilliant design and features. Initially I did not like that there were no station presets, but now I prefer the unique station-setting and choosing system ( I'd describe it but I would not do it justice.) I've had Healthkit, Dynaco and Adcom tuners previously but without going into specs, the NAD is my favorite. And, given that tuners are becoming increasingly rare, I am extremely glad the NAD C 427 is available. The unit is well made, great sound. My older NAD had the LED light burn out on the display, so replaced it with this one. Very nice sound, good reception. I'd say it is worth the price. We have not received any answers from other customers on your question. I think this will likely come down to the kind of performance you are looking for. I would recommend reaching out to an Advisor by phone (1-800-324-9695) or online chat. They should be able to help determine if this tuner is right for you, and discuss other options if it is not. Searches related to the NAD C 427 AM/FM tuner.